Orange and Pink or is it Pink and Orange, Hmmmmph. but together they're explosive.What a rush I get just seeing them paired. Hubs to this lovely resort. Richard Nicoll Silk color-block dress ...very fashion forward don't you think. A definite conversation piece that one. with a cute pink clutch. I just found a very nice orange sarong with pink polka dots for my up and coming resort trip, soooo, of course I'm on the look out for more pink and orange ideas for my summer wardrobe. Whose with me????? Cheers to all my lovely followers everywhere. It's funny how orange and pink together used to be such a no go area but all of a sudden it actually looks rather cool! Thank you for your lovely comment and for following, dear! Follow you back now! And I'll soon answer your question! Oooh I swoon over these colours!! How lovely! ooh! that colour block silk dress it to die for. i love the orange and pink colour combo too. love that Victoria Beckham orange dress,styled with the pink clutch.Really nice combination. I was wearing this color combo this week! Love that H & M dress. Either way, I like it! Thank You for the follow I appreciate it! and I also love this post the white bathing suite and the last dress I Love it! I'm a new follower! I hope you'll visit me at www.weidknecht.com! i am loving the pink and orange combination! it's absolutely gorgeous together but i never would have thought to put the colors together! I think I am in need for pink and orange sandals! 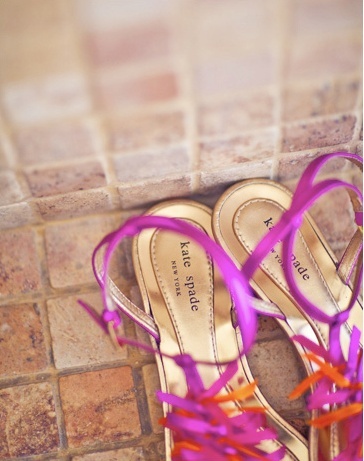 I LOVE the Kate Spade shoes! Gorgeous! And that cover-up! I know know why I've never paired pink & orange together!!! This post is making me obsessed! !